Will Bourges Basket's 13th season in EuroLeague end in glory? Bourges Basket's EuroLeague women's history is impressive. This is their 13th participation in this competition. 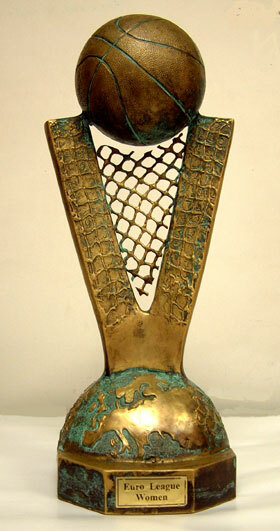 They have won the trophy on three occasions and have participated in seven final fours. They last won the trophy in 2001 and finished fourth in the 2007 edition. This season Bourges have dominated the LFB with 24 victories in 25 games. They have also qualified for the Coupe de France. They have also had an amazing EuroLeague campaign that saw them recover from a poor start with only one win from five games. They went on to win their final five group games to finish 6-4. Then they went on to sweep the teams from Sopron and Fenerbahce in the knock-out stages to qualify for the final. Sonja Petrovic, 19 year-old Serbian international, is currently FIBA Europe's junior women player of the year. She played for Barcelona in Spain last season. She had already won all the possible honours in Serbia with Red Star Belgrade. Petrovic also picked up a MVP award during the European Women U18 Championship in 2006. Belinda Snell, 27 year-old Australian international, has been picking up since 2006 nothing but winners medals. She was a member of the Australian team that became World Champions in 2006. Snell also picked up a Commonwealth games gold medal in the same year. In 2007 she was a member of the 2007 WNBA Champions Phoenix Mercury. This is only her second season in Europe. Last season she played in Italy . Cathy Melain is the oldest member of the team. At 34 she has won every domestic honour in the game and was a member of the French team that won EuroBasket 2001. Melain entered Bourges Basket's folklore when she put in the winning shot in the 2001 EuroLeague women final against USVO. Endeme Miyem will be 20 in May. She is in her second season at Bourges and is a product of the French Basketball academy CFBB (INSEP). She has played for France at youth international level and picked up a World U 21 bronze medal last season. Ana Cata-Chitiga is the youngest member of the squad.She is still only 18. Chitiga is in her first season at Bourges after passing through the CFBB. She has played for France at junior level and won a bronze medal last season at the U 20 European Championship. Céline Dumerc, 25 year-old and captain, came to Bourges in the summer of 2003 after three years at Tarbes. There she was LFB young player of the year on two occasions. Since 2005 she has been a permanent member of the French national team. Carrine Paul is 19 years old and in her second season with the club. She signed with Bourges at the same time as Miyem after passing through the CFBB. She has played for France at junior level and was a key member of the U 20 team that won a bronze medal at the European Championship last season. Sonja Kireta, 1m 98, 31 year-old Croatian international, is in her fourth season in France. In 2003-2004 with Aix-en-Provence she was the LFB best blocker. Kireta played for USVO in the 2006 EuroLeague women final and picked up a bronze medal. She left USVO after only one season and is now in her second season at Bourges Basket. Florence Lepronis 23 years old. She is also a product of the CFBB and between 2001 and 2005 played for the French junior teams. She collected European gold medals at U 16 and U 20 level and also a bronze medal at the U 21 World Championship in 2003. Emméline Ndongue will be 25 in two weeks time. She is the only French player in this team that did not pass through the CFBB. She is a product of Bourges Basket's own academy (centre de formation). Ndongue has spent all but two years of her professional career with Bourges Basket. She was a squad member during Bourges' 2003 EuroLeague final four participation. She had a brief spell with the Los Angelos Sparks in the WNBA and was also a member of the French team that won a bronze medal at the U 21 World Championship in 2003. Nora Bujdoso, 22 year-old Hungarian international, is in her first season out of her native country. She was a key member of the Hungarian junior team and made her mark during the 2004 U 20 European Championship. Pierre Fosset is the president of the club and the person responsible for putting together the jig-saw puzzle that is Bourges Basket. After bringing Pierre Vincent in as head coach, back in 2003, he was not in a hurry for domestic success. At the start of this season, Fosset said that the objectives for this season was to defend the Federation Cup, go back to Paris Bercy for the Coupe de France, regain the French Championship title and try and qualify for the EuroLeague final four. Will this be the year that Bourges Basket conquer Europe?